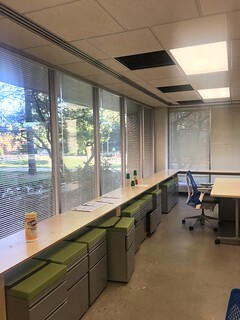 We are living in our new Hub space in Wells Hall. For such a big shift of space and place, it has been (in my opinion) a very smooth transition. Our physical space is deliberately open and meant to be a co-working space. People are coming in and out, working together, having chance collaborations and meetings or and getting work done and finding places to settle. I seek out co-work spaces when I travel. I find them friendly, lively and conducive to collaboration or for productively working alone in a “nook and cranny.” When I was working at MYR Co-work (in Myrtle Beach) they had a great electronic check in system where you indicated your status when you checked in – open to collaboration, working alone, etc. In the first few days of working together in The Hub, it quickly became apparent that we needed this messaging system. We may be in a group meeting, in the open, and focused – not wanting to be disrupted. Or, we could be working on a project independently and in desperate need for a collaborator or someone to bounce ideas off of (that’s why we are in this space!) 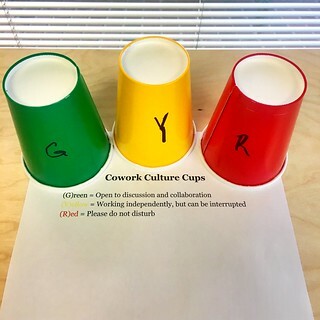 Co-work cups to the rescue! If you stop by to work with us, the cups can be found along the windows to your left when you walk in!